Ann Connolly is back on YouTube with another YoYoFactory product review, this one for for the controversial-ish Wide Angle Shutter that looks like a bi-metal but isn't! It's a fun yoyo though, and Ann is always a joy to watch so dig in! Ann Connolly is back on YouTube with another YoYoFactory product review, this one for for the controversial-ish YoYoFactory Wide Angle Shutter that looks like a bi-metal but isn’t! It’s a fun yoyo though, and Ann is always a joy to watch so dig in! It warms my cold, black heart to see Gentry and Ann palling around in London, Hans breaking a Guinness World Record for Most Loops in One Minute, and Gentry doing an interpretive dance on hoverboard to someone singing Journey at the London Toy Fair. I mean...this is pretty much all of my favorite things, really. Yoyos, classic rock, fog, tea, bridges, and good humans. Perfection! Yoyos used are the YoYoFactory Shutter and Czech Point Pivot. It warms my cold, black heart to see Gentry and Ann goofing off in London, Hans breaking a Guinness World Record for Most Loops in One Minute, and Gentry doing an interpretive dance on hoverboard to someone singing Journey at the London Toy Fair. I mean…this is pretty much all of my favorite things, really. Yoyos, classic rock, fog, tea, bridges, and good humans. Awesome! Yoyos used are the YoYoFactory Shutter and Czech Point Pivot. The ladies of Basecamp shot some tricks during their trip to the 2017 World YoYo Contest in Iceland! Check out the new new from Ann Connolly, Tessa Piccillo, Karolina Zahrubska, Betty Gallegos, and Ewelina Wejner. Yoyos used are the YoYoFactory Edge, CLYW Kodiak, and CLYW Igloo. The ladies of Basecamp shot some tricks during their trip to the 2017 World YoYo Contest in Iceland! Check out the new new from Ann Connolly, Tessa Piccillo, Karolina Zahrubska, Betty Gallegos, and Ewelina Wejner. Yoyos used are the YoYoFactory Edge, CLYW Kodiak, and CLYW Igloo. Ann Connolly gets super in-depth about the YoYoFactory Velocity, her pick for best starter yoyo ever! This is a great video to point someone to if they're just getting interested in yoyoing and trying to sort through the hundreds of options. And then you can point them to YoYoExpert to pick up a YoYoFactory Velocity yoyo! Ann Connolly gets super in-depth about the YoYoFactory Velocity, her pick for best starter yoyo ever! This is a great video to point someone to if they’re just getting interested in yoyoing and trying to sort through the hundreds of options. And then you can point them to YoYoExpert to pick up their own YoYoFactory Velocity yoyo! Ann Connolly is moving, and she has too much stuff for her tiny little apartment in Prague. Comment on YouTube for a chance to win something from her collection so she has less stuff to pack! Ann Connolly navigates into treacherous territory with a new video about...stuff she can't do. I'm feeling this one a lot, since I'm a National YoYo Master who can't do horizontal 1A, and is awful at 2A and 4A. Sometimes you've got to just accept your limitations. Other times you should practice hard and overcome them. And still other times you should just make a funny video about them and rack up those views, amirite? Ann Connolly navigates into treacherous territory with a new video about…stuff she can’t do. Sometimes you’ve got to just accept your limitations. Other times you should practice hard and overcome them. And still other times you should just make a funny video about them and rack up those views, amirite? Some of Ann’s weaknesses include fingerspins, Shoot the Moon, and Seasick and to be fair those are some tough ones. Seasick and Shoot the Moon especially are all about timing and can take a while to lock down. Same for Boingy Boingy and other “timing” tricks from that era. But hey…keep at it and you’ll get them eventually. And if not, there’s a (not really) lucrative career in your future, where you can video blog about not being able to do them. YoYoFactory player Ann Connolly brings us a great yoyo trick tutorial video, for a trick inspired by Basecamp player David Stejskal. 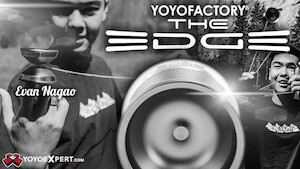 Yoyo used is the YoYoFactory Edge. YoYoFactory player Ann Connolly brings us a great yoyo trick tutorial video, for a trick inspired by Basecamp player David Stejskal. YoYoFactory player and all-around fantastic human Ann Connolly is back with another review of a new YoYoFactory yoyo, this time for the Paolista! The new signature model for Paolo Bueno, the YoYoFactory Paolista is a solid contest yoyo that's just hitting shelves now. Check it out! YoYoFactory player and all-around fantastic human Ann Connolly is back with another review of a new YoYoFactory yoyo, this time for the Paolista! The new signature model for Paolo Bueno, the YoYoFactory Paolista is a solid contest yoyo that’s just hitting shelves now. Check it out! Yoyo used is the YoYoFactory Paolista. YoYoFactory team member Ann Connolly reviews their recent bi-metal yoyo release, the Space Cadet! We always love hearing what Ann has to say about yoyos, and this video is a great starting point if you’re considering picking up a YoYoFactory Space Cadet. (Spoiler: you should.) 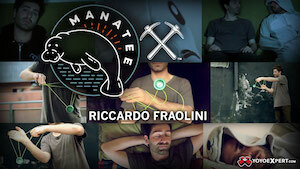 Another great bi-metal release from one of the biggest names in yoyoing…check it out! Yoyo used is the YoYoFactory Space Cadet. YoYoFactory player Ann Connolly brings us another yoyo review from her YouTube channel, this one for the Basecamp Sherpa! This new slimline yoyo from the Basecamp (CLYW x YoYoFactory) line ships responsive but comes with a longer axle and Center Trac™ bearing for unresponsive play. It's also got aluminum caps and a fully hollow body design, and it feels like nothing else in your hands. 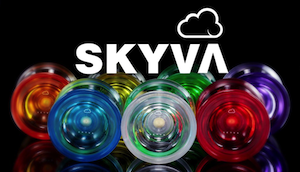 YoYoExpert just restocked the Basecamp Sherpa in all colors, along with a new color: Aqua! Scoop one up today! YoYoFactory player Ann Connolly brings us another yoyo review from her YouTube channel, this one for the Basecamp Sherpa! This new slimline yoyo from the Basecamp (CLYW x YoYoFactory) line ships responsive but comes with a longer axle and Center Trac™ bearing for unresponsive play. It’s also got aluminum caps and a fully hollow body design, and it feels like nothing else in your hands. 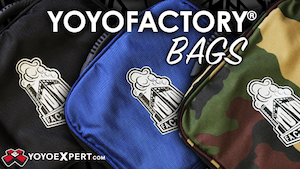 YoYoExpert just restocked the Basecamp Sherpa in all colors, along with a new color: Aqua! Scoop one up today!